Erik and I like to celebrate every year by decorating our house and enjoying a festive dinner. 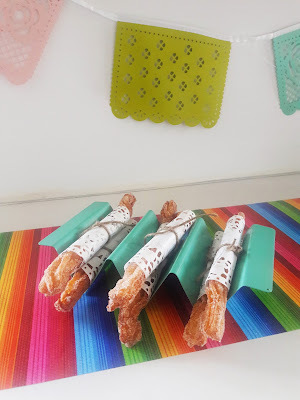 The last few years I have tried to get over to Trader Joe's and buy their mini churros but I am never quick enough. 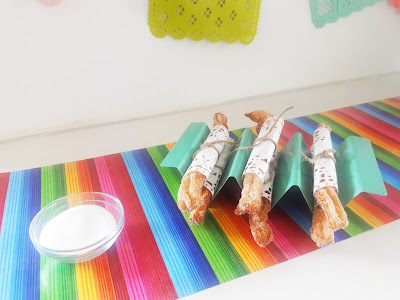 So this year I decided to make my own using this recipe I found on Pinterest. Combine the sugar, butter, water and salt in a saucepan. Add flour, stir well, and cook the mixture over low heat for two minutes. Place the mixture into a large bowl and let cool for ten - fifteen minutes. Once cool, add in eggs one at a time and mix well between each addition. If you place the eggs right into the hot mixture they will cook. Make sure your mixture has had plenty of time to cool. Place dough into a pastry bag fitted with a large star tip. Add the oil into a large saucepan over medium high heat. Heat the oil until 350o Fahrenheit. Pipe three to four inch sections of dough into oil. Fry each side until light golden brown, about one to two minutes. Remove the churro from oil and place on a paper towel to cool for one minute. Who doesn't love a warm churro? 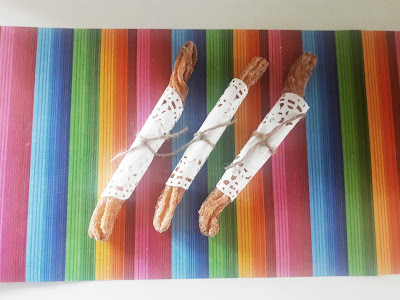 I wrapped my churros in doilies and added twine for decoration. 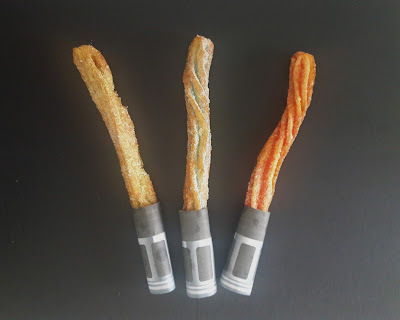 Also, since today is May the Fourth I decided to make a few lightsaber churros for Erik and I to enjoy while we watch Star Wars tonight. Just divide your cinnamon sugar into separate bowls and add in colored sanding sugar. Toss your churros in these fun colors to make them look like lightsabers. I added these napkin wraps to the bottom to complete the look. So many fun events this weekend! Do you celebrate either of these "holidays?" I'd love to hear how!